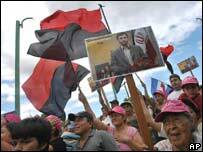 Iranian President Mahmoud Ahmadinejad has pledged closer ties with Nicaragua as he continues his Latin America tour. "We have common interests, common enemies and common goals", he said as he visited shantytowns in Managua with the Nicaraguan leader, Daniel Ortega. Mr Ahmadinejad arrived in Nicaragua from Venezuela where he signed business agreements with President Hugo Chavez. The Iranian president's visits are aimed at boosting ties with the region's most vocal critics of the US. The aim is also to garner further support in the international debate over Iran's nuclear programme and its alleged interference in Iraq. Some of Latin America's leftist leaders are also keen to expand ties with oil-rich Iran, correspondents say. This development has concerned Washington, which accuses Tehran of sponsoring terrorism and seeking to build a nuclear bomb, charges the Iranian government denies. The Bush administration is watching Mr Ahmadinejad's tour closely, says BBC Latin America correspondent Duncan Kennedy. As well as meeting Mr Chavez and Mr Ortega, Mr Ahmadinejad is also due to attend the inauguration of Ecuador's leftist new President Rafael Correa. It is also expected that the Iranian president will meet Evo Morales of Bolivia. Mr Ortega took his visitor on a tour of shantytowns in the Nicaraguan capital, Managua. Hundreds of people turned out, waving flags of Mr Ortega's Sandinista party and holding photographs of the Iranian president. "The imperialists don't like us to help you progress and develop. They don't like us to get rid of poverty and unite people," said Mr Ahmadinejad. "But the whole world knows that Nicaragua and Iran are together." The two countries announced that they were restoring full diplomatic relations and re-opening embassies in their capitals.